While deciding on pursuing education in a newly set-up environment, what would be the factors one should evaluate? 1. How credible is the Institute? Credibility at GRMI is defined by the quality of leadership that is driving the entire Programme — a leadership that is driven by the passion and belief in giving back to the society that has helped them become iconic figures in their domain. GRMI, led by the Dean and ably supported by a distinguished Board of Directors and Strategy Board, an internationally-represented Board of Governors, and an impressive Academic Council aims to be a hallowed portal for creating future leaders for the country and the globe. 2. What distinguishes the programme from others? The curriculum and learning experience are co-created with the key stakeholders of the ecosystem of risk – leading corporates and risk consulting firms. This ensures the relevance and acceptance of both the curriculum and the qualification. 3. Will I get experiences that are different from my other options? 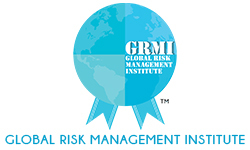 GRMI is committed to ensuring an environment where the students get to interact with more global leaders and risk practitioners than what any other institute can offer. Each of our members of the Board of Governors is committed to conduct sessions for the students either over VC or through classroom sessions. Additionally, there is a large list of industry and consulting well-wishers who are unable to commit enough time to be on our boards but are committed in principle to GRMI to make time for knowledge-sharing sessions with the students. We believe that the invaluable depth of the experience of these leaders far outmatches text-based knowledge accumulation, and hence GRMI prides itself in creating an experiential learning environment that is unparalleled in India today. 4. Is there something that only GRMI can provide me? In today’s age when the world is fast shrinking and globalization is the way forward for almost every large corporate, the need for effective communication is felt more acutely than ever before. Gone are the days when one could be a successful professional in India, and the the ability to communicate with global leaders was not essential for career enhancement. Being oblivious to global cultures is no longer a luxury that aspiring professionals can afford. Our experience shows that a significant percentage of domain talent loses out owing to a lack of communication skills on the one hand, and connect with the global scene on the other. At GRMI we have embedded as part of our student development programme a unique “Communication & Cultural Enhancement Module” that will be run through the year with an extremely personalized delivery. This will be aimed at improving each individual student on the two parameters of communication and cultural awareness on a 10-point scale. The improvement programme will be run on an absolute basis of improvement and not compared to the rest of the batch in order to ensure each student benefits and improves. We will partner with domain experts in communication and cultural enhancements to ensure we bring the very best to our students. At GRMI we are committed to building “world beaters” who will be all-rounded professionals and not mere risk domain experts.